Sure, you destroyed the human race with some nasty fungus. Now let's see what the undead will bring. 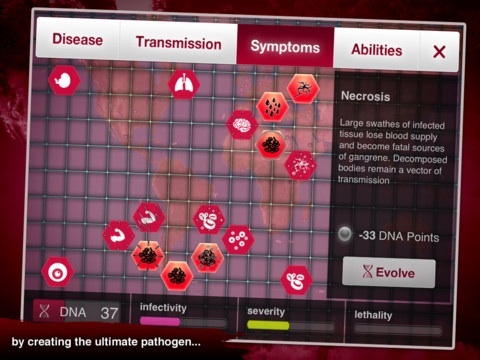 We love how transparent Ndemic Creations has been with its hit iOS title, Plague Inc. Instead of keeping its numbers a mystery, the publisher has gone on record, with the game being downloaded almost 750,000 times at $0.99 a pop. We can all do the math. That said, the developer just released Update 1.2, and has already moved on to 1.3. What'll it bring? New languages, apparently, along with new disease types (cross your fingers for the dreaded zombie virus), new events, achievements, custom music and Facebook/Twitter integration. There's even rumblings of Android support, despite the fact that it has nothing to do with Update 1.3. Just thought we'd mention it. On that note, great to see a phenomenal game continuing to improve. Now bring on the zombies. Read Modojo's Plague Inc. review.